Something's In the Air: But What? When Berkeley Lab Director Charles Shank arrived here 10 years ago, the facility had an operating budget under $200 million, the General Sciences (including the Bevatron) represented more than a third of the research, and computing sciences barely made it on the programmatic pie chart. Today, operating budgets run around $323 million, the Biosciences and Energy Sciences make up the biggest slices of the pie, and computing sciences, with the recent arrival of the supercomputing center, represent almost one-fifth of the enterprise. "It's been pretty much continuous growth," Shank told a capacity audience in the Bldg. 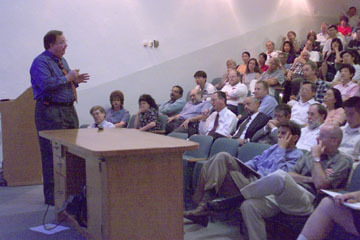 50 auditorium on June 30 at his annual State of the Laboratory address. But rather than look back, he said he'd prefer to look ahead to the Lab's prospects and opportunities for the next 10 years. His "Vision 2010," with its five prospective growth areas, holds enormous potential for new activities, Shank said. The unique capabilities and competencies of the Laboratory, tied together by computing and computation and multidisciplinary teams working at the edges of their fields, "give the Lab an extraordinary vitality and a real opportunity to make significant advances in the years to come," Shank said. Those areas include work in the fundamental understanding of the universe, complexity and complex systems, quantitative biology, new energy sources and environmental solutions, and integrated computing, the enabling tool of the 21st century, he said. Summarizing this year's milestone research breakthroughs in astrophysics and nuclear science -- discovery of the "accelerating universe" and of two new heavy elements in the periodic table (118 and 116) -- Shank took note of Berkeley Lab's recognized leadership in studying the fundamental properties of the universe. "We have an opportunity to take what's out there (in space) and use it to apply to a new understanding of the universe and particle physics," he said. The director outlined a new research initiative being driven by astrophysicist Saul Perlmutter to mount a 1.8-meter telescope on a satellite to further probe the properties of the universe by studying distant supernovas. He said a partnership with NASA is possible. Shank also cited the recent contributions made by Berkeley Lab to major national scientific facilities studying the fundamental properties of matter: the STAR detector at Brookhaven's Relativistic Heavy Ion Collider, the Sudbury Neutrino Observatory in Canada, and the B Factory at the Stanford Linear Accelerator Center -- all on-line or scheduled to take data this summer. He noted that future projects speak to the need to develop new, more cost-effective ways to study basic questions in particle physics "on the edge of the energy frontier." One such tool could be optical and laser accelerators, combined with the analytical capabilities of large-scale computing. In all of these cases, Shank told Lab employees, project successes derived significantly from the important contributions of the Engineering Division and cited the newest division director, Jim Triplett, for the valuable perspectives he will be bringing to the engineering program. The research field known as "complexity" was explored recently in a workshop hosted by Berkeley Lab and co-chaired by DOE's associate director for Basic Energy Sciences, Pat Dehmer. Shank said this is a fertile ground for scientific exploration, in areas such as understanding molecular machines and new materials design and assembly. Director Shank delivering State of the Laboratory Address. He said the Advanced Light Source will be a significant contributor to such efforts in the coming years. The ALS, which he described as being "on a very positive slope," increased its user base three-fold in only two years. "It's becoming a hotbed of scientific activity," he said, citing recent advances in the areas of superconducting quasiparticles, nanostructure imaging, photoemission electron microscopy, and macromolecular crystallography. Third harmonic cavities are installed and working to increase the beam lifetime, and forthcoming superbend magnets will increase brightness in the intermediate x-ray regime of the ALS, he added. In quantitative biology, Shank called out the work of the Joint Genome Institute and its massive collection of data as central to the challenges ahead in what he called "a revolution in biology." "Biology has been an observational field," he said. "But now it's moving into a more quantitative field, and in the new century it will be a predictive science. Physics, chemistry and math will play more important roles as we build on the work in the genome, through modeling and simulating systems through computing." New technologies are being deployed at the Lab to study structural dynamics and the complexities of so-called molecular machines, he said, with Berkeley Lab nicely positioned to lead the effort. He pointed to a new partnership with UC Berkeley in the biosciences as a key component "which will synthesize the strengths of both institutions." As the world addresses problems growing from today's fossil-fuel-based economy, work in energy and environment will become increasingly important. Shank pointed out Laboratory initiatives in inertial fusion energy, carbon sequestration, and electricity reliability as prime target areas for development. He also recognized two efforts in energy efficiency this year that brought praise to Berkeley Lab: the national launch of the interactive Home Energy Saver website and the integrated lighting project at the Rodeo Post Office, which will be adapted to a national program by the U.S. Postal Service. Shank took the time to cite three individuals who received prestigious honors in their fields: John Clarke, who earned the National Academy of Sciences' Comstock Prize for his work with Superconducting Quantum Interference Devices (SQUIDS); Andrew Canning, whose team received the Gordon Bell Prize for highest computing speed using a real-world application; and Phil Colella, who won the Sidney Fernbach Award for major contributions in software methodology development. "The world of computing is changing very rapidly," he said. "The sophistication here has increased dramatically since the arrival of NERSC, but still we have a ways to go to make computers an essential tool for discovery." Shank pointed to the recent arrival of the new IBM "NERSC 3" computer which, when completely installed, will boost the total NERSC supercomputing capacity to four teraflops. He noted that the machine will eventually be named "Seaborg," in honor of Berkeley Lab's distinguished Nobel laureate who died in February. Shank closed with a personal reflection about the recent Department of Energy difficulties over issues surrounding secrecy and security at the national weapons laboratories. Saying that Berkeley Lab, which engages only in non-classified research, "has been built on a foundation of international connections and by people from all over the world," he vowed to "vigorously pursue opportunities to create an environment in which the entire world is welcomed here and that encourages the interchange of ideas." In answer to a follow-up question, Shank added, "I believe in the process of working out something [in Washington] that will keep our laboratory the way it is." The intricate and mysterious architecture of the cellular microcosm -- complete with its own "freeways," "comets," and a host of other until-recently-invisible structures -- came to life with stunning visual clarity last Wednesday during Berkeley Lab's first summer lecture of the season. The speaker -- cell imaging expert Carolyn Larabell of Life Sciences -- could not have asked for a better audience, which nearly filled the Bldg. 50 auditorium. Nor could her audience have asked for a more timely, cutting-edge topic to kick off the five-week lecture series -- or a more respected expert in the field. Entitled "Imaging the Cellular Universe: Comets, Particles and Transport Phenomena," the lecture zeroed in on the rapid advances in the field of cell biology, which were made possible by powerful new imaging tools that allow scientists to peer inside whole living cells. "It's a very exciting time in developmental biology," said Larabell, a pioneer in the application of x-ray microscopy to this field, as she unveiled spectacular images and time-lapse films, whose impact was further enhanced by state-of-the-art presentation tools. "Cells are very dynamic," she said. "While you're here relaxing they're very busy, doing a lot of things." Larabell has devoted much of her career to studying and imaging the innermost secrets of the cells: their structure, how they function (or misfunction), why abnormalities such as cancer occur, how disease penetrates cells, and the mechanisms by which particles of many different sizes use to move in and out of them. To understand these phenomena, cell biologists today, in what Larabell called the post-genomic era, need new and increasingly more powerful imaging techniques, not necessarily to replace but to complement the time-tried ones. Over the decades, scientists have relied on three types of technologies to view cell structures: The oldest, most commonly used method is light microscopy. Unfortunately, its best resolution (200 nanometers) is not adequate for many of today's demands. Electron microscopy, Larabell said, revolutionized our understanding of cells during the 1960s and 1970s. With its extremely high resolution (a tenth of a nanometer or better) it unveiled for the first time the very organized structure of the cells. "They have an architecture," she said. "Like buildings have foundations, so do cells." 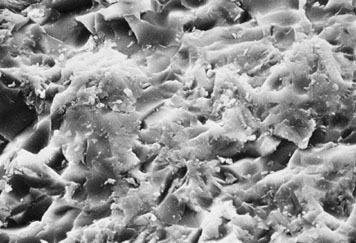 The downside of the technique is that cell slices must be dehydrated and embedded in plastic to be viewed, a process which can result in loss of protein, which is precisely what scientists like Larabell want to study. This is where x-ray microscopy comes in. The technique, used at beamline XM-1 at the Lab's Advanced Light Source, provides high resolution information in thick, hydrated cells. To illustrate the power of these tools Larabell displayed pictures of fertilized frog eggs injected with fluorescent proteins. As the labeled proteins penetrate the membrane, they permit the imaging of a cascade of biochemical events. The film, sped up 30 times, vividly showed that chain of events. As a means of comparison, Larabell also projected an image of a membrane obtained with an electron microscope. The remarkably detailed picture showed even more of the cell's structure, but was static. Therefore, Larabell explained, scientists need a variety of imaging techniques to obtain both spatial and temporal information. Larabell's films showed some very busy particles which she calls "comets," complete with tails they build from actin molecules to move inside the cell and push around subcellular particles. Unfortunately, these same actin comets also act as vehicles to drive particles into dangerous -- sometime fatal -- encounters with bacteria, such as Listeria, which infects meat. "The bacteria are very clever and have created a mechanism to move around cells," Larabell said. "It turned out to be a very handy mechanism: 20 percent of the people who became infected died." As it turns out, she added, the bacteria did not create this mechanism but penetrated the cells and then used the cell's existing mechanism. To understand this system Larabell uses the x-ray microscopes at the ALS. At a resolution of 30 to 50 nanometers, her images have recently revealed never-before-seen linear structures inside cells which act as a transport system. "It's pretty much like a freeway system in the Bay Area," she said pointing at the screen, and quipped, "actually it's much faster than a freeway system in Bay Area" -- at a whopping 30 microns a minute. Another film of particles moving at nearly 50 microns a minute she likened to the "hustling and bustling in downtown New York at Christmas time." Fun aside, Larabell is constantly keeping busy delving deeper and deeper inside the cells to answer some key questions about them. One of her foremost goals is to understand the cell nucleus. Only a few decades ago, she said, did scientists begin to realize that cells are not cushy bags filled with jello but highly organized structures. Today we are on the verge of understanding the nucleus and unraveling its organization. Larabell and her colleagues also hope to improve scientists' understanding of the "scaffolding" supporting the cells, which they hope will lead to advances in the area of breast cancer. As better techniques for cell imaging are developed, a new universe opens to science, and Berkeley Lab and researchers like Larabell are key players in this new era of cell biology. "We are very fortunate here at Berkeley Lab," Larabell says, "because we are in a position to pioneer a technique for imaging cells which is used by cell biologists around the world." The next summer lecture, on July 21, will feature Pier Oddone who will talk about "The Asymmetric B Factory: Reflecting the World in the CP Mirror." It's the dead of winter at the South Pole's Amundsen-Scott Station: 41 people inside the dome, and outside, round-the-clock darkness, 60 mile-per-hour blizzards, temperatures at 80F below -- and it's over 800 miles to the nearest human settlement. Nobody gets in or out until spring, October at the earliest. On June 28, after a 47-year-old American woman who works at the station discovered a lump in her breast, a call for help went out by e-mail. Medicine and diagnostic tools were urgently needed. An emergency airlift was the only answer. Chuck McParland of Berkeley Lab's Information and Computer Sciences Division got the call from the National Science Foundation, which runs the polar station. He immediately volunteered the Lab's assistance. Computer communications software and hardware were critical so that personnel at the South Pole could confer in real-time with doctors in the United States and exchange medical images. 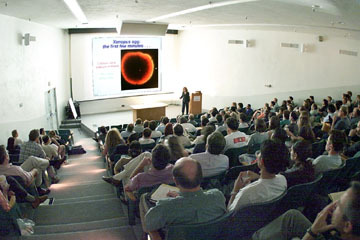 ICSD's Deb Agarwal, currently on assignment in Vienna, Austria, as a technical consultant to the Comprehensive Test Ban Treaty Organization, contributed her expertise; Agarwal's use of Multicast Backbone tools (MBone) for NASA's "Live From the Poles" educational TV program in 1998 had alerted the NSF to Berkeley Lab's Internet conferencing capabilities. McParland took the lead, and within days Lab personnel had assembled the communications package. "We specified the right equipment for reestablishing the link and helped track down the necessary equipment," he says; the equipment includes two noise-cancelling headsets donated by the Lab. Inquiries to Department of Energy colleagues at Argonne and Oak Ridge National Labs helped locate the digitizing cameras for use with microscopes. McParland also helped find vendors who had the equipment in stock and who could deliver overnight. "It was amazing -- everyone just jumped in with both feet," McParland says, crediting researchers from NASA, the NSF and other organizations. "There was a real sense of `Do it now! Do it fast!'" 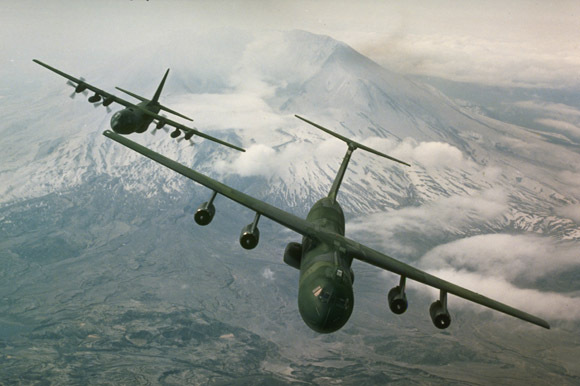 A Lockheed C-141 Starlifter from McChord Air Force Base in Washington State flew the equipment and supplies to Antarctica via New Zealand. From Christchurch to the South Pole is a 6,375-mile round trip, with the pole itself at 10,000 feet altitude. The big jet made two passes over the station on Sunday, July 10, dropping six pallets 700 feet to a target area marked out by blazing oil drums. The Lab's part of the package included two computer workstations and microscopes equipped with digital imaging cameras -- duplicates against mishaps when the pallets hit the ice at 60 mph. Guided by flashing strobes on the pallets, ground personnel had just seven minutes to bring the gear in out of the howling, subfreezing darkness. An apparently successful drop was confirmed by Air Force personnel and reported by the Associated Press earlier this week. Computer connectivity to Antarctica is provided only via satellite, and then only for five or fewer hours per day. The original MBone capability that linked Berkeley Lab and South Pole researchers in early 1998 was disassembled last year, but the Lab's computer scientists have continued to develop "collaborative technologies" which allow scientists at remote locations to collaborate and have access to specialized experimental facilities by way of the Internet. "While our collaboratory effort has been targeted first at science, we always believed that the same technologies would help in education and remote medicine. It is great to see the tools being used this way," said Stewart Loken, head of ICSD at Berkeley Lab and leader of the collaborative technology program. A U.S. Air Force C-141. Starlifter transport jet like the one pictured here, flew to the South Pole last weekend to drop emergency medical equipment and supplies for a researcher at the Amundsen-Scott Station who had discovered a lump on her breast. In a reversal from an earlier position, Energy Secretary Bill Richardson has now endorsed a proposal by Senate Republicans to create a semi-autonomous Agency for Nuclear Stewardship (ANS) within DOE. With the senators apparently having satisfied Richardson that his authority over the weapons complex would not be diminished, the Secretary's staff members are telling reporters that they have been directed "to accept the notion of a semiautonomous agency and to negotiate with Congress." Leading the negotiations for DOE will be J. Gary Falle, Richardson's chief of staff; R.P. Eddy, a special assistant; Joan Rohlfing, senior policy adviser for nonproliferation and national security; and John Angell, assistant secretary for congressional intergovernmental affairs. Microscopist Werner Meyer-Ilse, one of the brightest lights in the galaxy of star researchers at Berkeley Lab's Advanced Light Source, died on Wednesday, July 14, from injuries sustained in an automobile accident in Germany. He was 43. Meyer-Ilse was a staff scientist for the Center for X-ray Optics (CXRO) in the Materials Sciences Division, and the man who directed the design and construction of ALS beamline 6.1.2. Also known as XM-1, this beamline is a direct-imaging transmission x-ray microscope acknowledged by experts to be one of the finest instruments of its kind in the world. Once it was built, Meyer-Ilse oversaw all the research conducted with it. "My personal interest is to develop x-ray microscopy, and I am only able to do this in a collaborative manner," he once said in an interview. "Therefore all of the users of this beamline, from all their different scientific fields, become my collaborators in developing the technology." Meyer-Ilse is survived by his wife, Andrea, and his daughters Eva, a freshman at U.C. Berkeley, and Julia, a high school student. The family resides in Lafayette. His wife Andrea is also from Göttingen, and they were high school sweethearts. Meyer-Ilse first came to Berkeley Lab in 1989 to work as a physicist with the Accelerator and Fusion Research Division. He was here only a few months before going back to Germany. 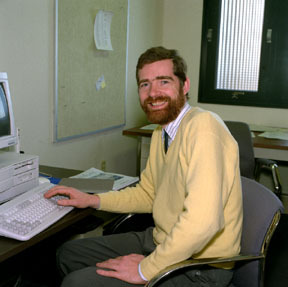 He returned on a more permanent basis in February 1992 to work at the CXRO on the development of XM-1 and future high-resolution x-ray microscope beamlines. "Werner thought of the Lab as a very special place, and he was here to stay," said CXRO head David Attwood. "He wanted to do every aspect of the microscope and every application. It was, he said, the only way to ensure excellence." Meyer-Ilse will be buried in Germany. A local memorial service will be arranged after his wife's return. Two technologies developed by researchers in Berkeley Lab's Environmental Energy Technologies Division (EETD) made the list of five energy-saving initiatives sponsored by DOE in the 1990s that were singled out by the American Council for an Energy-Efficient Economy (ACEEE) as the decade's "most successful." They are the compact fluorescent lamp (CFL)-based replacements for halogen torchieres, a development led by Michael Siminovitch, and spectrally selective low-emittance (low-E) and solar control windows, a development led by Michael Rubin. Both researchers work in EETD's Buildings Technologies Department. The other three initiatives were new housing designs and construction techniques from the Building America program, alternative refrigerants and insulation blowing agents, and building standards and guidelines. All five technologies were funded under DOE's Office of Buildings Technologies. "These [five technologies] demonstrate that DOE can achieve a high degree of leveraging and impressive results with modest R&D, testing, or deployment support," said Howard Geller, ACEEE's executive director, who presented a report to Congress this past spring on his organization's study of the five initiatives. "Some of the projects, such as the CFL torchiere and solar control windows, cost the federal government less than $5 million each," said Geller. "But by addressing clear needs in the marketplace and fostering partnerships between DOE's national labs and the private sector, these projects were very successful." CFL torchieres use about one quarter of the energy and put out more light than halogen torchieres -- plus they are much safer because they operate at far cooler temperatures. In 1997 the CFL torchiere won the "Best of What's New" Grand Prize Award for Home Technology from Popular Science magazine. Working with Siminovitch on its development were Erik Page, Jeffrey Mitchell and Linsey Marr. Low-emittance coatings have a high reflectance of infrared light, which enables them to admit as much daylight as possible while reducing solar heat gains and losses. Rubin carried out assessments for DOE which showed that cooling costs due to windows are significant even in colder climates and that reducing solar gain in hotter climates can substantially cut energy costs. He also demonstrated that a significant degree of solar control can be built into these coatings through select spectral reflectance. Stated the ACEEE study report, "These (Berkeley Lab) studies helped convince major glass and window manufacturers to introduce solar control low-E glazings in the late 1980s and early 1990s." ACEEE concluded in its study that the benefits from these program have far exceeded costs, and called upon DOE to expand and replicate them. In May, in a two-to-one split decision, the U.S. Circuit Court of Appeals for the District of Columbia declared parts of the Clean Air Act unconstitutional. The decision threatens implementation of the Environmental Protection Agency's 1997 air quality standards, which are based on health effects and include standards for particles only 2.5 micrometers in size. Yet the court also stated that "evidence demonstrating a relationship between fine particle pollution and adverse health effects amply justifies establishment of new fine particle standards." Thus it seems unlikely that national standards for fine particulate matter will be delayed for long. In June, EPA Administrator Carol Browner testified before Congress: "We stand by these standards. We stand by the science. We stand by the process." At Berkeley Lab, Lara Gundel of the Environmental Energy Technologies Division (EETD) emphasizes that "there are lots of unanswered questions about how particulate matter affects health," and she is busy developing and implementing a means to help answer some of these questions. "Particle size is one factor," she says, "but particles are of very different kinds -- acid droplets, metals from incinerators, toxic compounds from gasoline and diesel fuels, soot from unburned fuel, and many others." Moreover, many pollutants exist in both particle and gas phases, including polycyclic aromatic hydrocarbons, which are ubiquitous in urban areas because of sources such as vehicle exhaust, and pesticides which abound in agricultural areas. "A major scientific problem has been getting good measurements of the partitioning of these chemicals between the gas phase and airborne particulate matter. At Berkeley Lab, we have the tools to answer these questions." These tools include some of the most advanced and versatile in the field, which is one reason why the EPA has kept Gundel busy as an expert on sampling. The tools are available because 10 years ago Gundel, her colleague Joan Daisey, head of EETD's Indoor Environment Program, and their associates began addressing similar problems in studies of indoor air quality. "We had a special interest in the physical and chemical characteristics of second-hand tobacco smoke," she says. "Tobacco smoke is an aerosol that dries fast. We realized we didn't know much about its gas-particle partitioning, and we needed a way to measure it." Gas and particles are deposited differently in the lungs and have different physiological effects. According to Gundel, the partitioning, over time, of the phases of a semivolatile organic substance such as nicotine "has thrown a monkey wrench into many measurements" aimed at determining health effects. Most phase measurements have been made by trapping solid particles on a filter and then collecting gases from underlying adsorbent beds. The filter itself, however, can absorb gases, and the particles may give up gases after they are trapped; both vaporization and condensation effects can thus lead to errors. That's why Daisey suggested that Gundel and her colleagues in the tobacco study use a "denuder" -- a device that traps gas and allows particles to be collected separately. Denuders are not commonly used with organic chemicals but, Gundel says, "as soon as Joan mentioned a diffusion denuder, I said, `I know how to do that,' and I vizualized the solution. It was a leap of faith." Her idea was to use sticky resin beads whose pores were the right size to trap molecules of organic gases -- small enough to adhere through friction alone to the sand-blasted inner surface of a glass tube. "Solid particles are relatively massive and travel straight through the denuder," Gundel explains. "The gas molecules are moving all over the place, like toddlers; eventually they hit the wall and stick. The trick is to calculate the airflow and the length of the tube -- to make it short enough so the particles stay airborne but long enough for the gas to get trapped." After an air sample is sucked through the denuder, the particle filter is removed and the gas trapped on the resin beads is analyzed. Gundel had a working model of a denuder which she later named the Integrated Organic Vapor/Particle Sampler, or IOVPS, built for the tobacco-smoke study. "We tried it in a room-sized chamber that held smoke from a single cigarette. In about 30 seconds we knew it was going to work." Gundel refined the IOVPS as part of a successful Cooperative Research and Development Agreement with URG Corporation in North Carolina, increasing the denuding surface and designing new features for collecting vapor subsequently released from trapped particles. A few years ago a Canadian researcher, Douglas Lane of the Atmospheric Environment Service, collaborated with Gundel to modify the IOVPS for much higher flow rates and continuous operation -- up to 48 hours at time -- which would allow it to be used for testing the atmosphere outdoors. The resulting Integrated Organic Gas and Particle Sampler (IOGAPS) comes in several sizes, the largest of which uses two denuder tubes with about 30 times the coated area of a single-channel IOVPS. Groups around the country have employed this sampling technology in studies of semivolatile organic compounds. Among these have been investigations of the atmospheric behavior of dioxins and the contribution of diesel, other vehicle exhausts, and wood smoke to smog formation -- all under different weather conditions, in different parts of the country, and at different times of the day or night. The EPA recently tested various air-sampler designs in cities throughout the country. As a kind of control for this test, the denuders were installed on what Gundel calls "old pieces of sampling equipment taken out of mothballs. The denuders are fitted on them like nozzles on vacuum cleaners." Air samplers with denuders got better results than samplers without, and now the IOGAPS devices are being used in other field studies in Seattle, Nashville and Atlanta. Gundel has also been testing "vacuums" with denuder "nozzles" for other interesting applications, such as cleaning the air in buildings. And to serve a wider range of uses, Gundel and her associates are evaluating various denuder designs -- some durable and pricey, others lightweight and based on common products available in hardware stores. A patent for the IOVPS technology was awarded in 1998, and Gundel and her associates are actively seeking licensing partners through the Lab's Technology Transfer Department. Already researchers armed with Lara Gundel's resin-coated denuders are finding out exactly what's in the air -- and in what phase -- all over the nation. Microscopic crevices in resin beads trap gas molecules when they hit the walls of the Integrated Organic Vapor/ Particle Sampler. A memorial service will be held at Berkeley Lab on Wednesday, July 28, for physicist William Rarita, who died on July 8 at the age of 93. 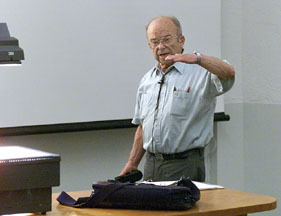 Rarita, whose contributions to the field of nuclear and particle physics spanned more than half a century, worked as a participating guest at Berkeley Lab in the Theoretical Physics Group until his retirement in 1996. Previously he spent a year at CERN in Geneva, Switzerland, and was a fellow of the American Physical Society. The memorial will be held in Bldg. 50-5131 at 3:30 p.m. on July 28. For the second consecutive summer, 30 science teachers from the Vallejo Unified School District and surrounding area have joined Berkeley Lab in a four-week educational project that aims to strengthen the district's science program through curriculum development workshops and joint science research between teachers and scientists. "Not everyone lives down the road form a national laboratory," says James McLelland, a physics teacher at Dr. James J. Hogan High School in Vallejo. "It's the deal of a lifetime." The Integrated Science Partnership Project (ISPP) -- codirected by Marva Wilkins, the Lab's education outreach coordinator, and former Berkeley High School science teacher Don Hubbard -- is funded by a federal grant to build a nontraditional integrated science curriculum in Vallejo area high schools. The project is divided into two working groups: curriculum developers, in which teachers team up to develop new classroom agendas, and "teachers as investigators," who conduct actual experiments alongside volunteer Lab scientists. "The ALS is a live example of integrated science," says Hubbard. "In this multidiscipline science research facility teachers can see a true representation of real life science. They get a more realistic sense of who scientists are and what science is than is possible in the classroom." The project was conceived by Marva Wilkins of the Center for Science and Engineering Education. "The need for innovative, quality staff development programs for teachers was the motivation for ISPP," she says. "The support of staff labwide, along with the rich resources here, make it possible to provide educators with this unique experience. Observing the teachers' enthusiasm and high energy makes this project one of the highlights of my career in education." Teachers in the program expand the traditional scope of a science class to include lessons on ethics, history, and social and cultural aspects of science. Says Susann Evans, coordinator for the curriculum development group and a teacher at Jesse Bethel High School, "Ultimately we want the students to become stewards for their environment -- to look at its value and protect it." Through ISPP teachers are developing innovative and engaging ways to stimulate their students. As a result of last year's program, for example, Vallejo High developed a "murder mystery" unit for their tenth grade integrated science class. Tom Knight, a Vallejo High science teacher, thought of the idea with Lab scientist Mike Martin, who uses infrared spectroscopy for forensics. The detective work of the students at Vallejo High included learning about DNA and analyzing footprints using chemistry, biology, physics, and math. This spring, students' science scores on the SAT9 statewide achievement test at Vallejo High were higher than those of the previous year, a trend the teachers hope will continue as the program develops. "When teachers are reenergized, they bring that energy to the classroom," says Cliff Solari, the assistant superintendent of the Vallejo School District, who came to observe his teachers at work. "The kids get excited about science and learn more." Tony Farley, the research coordinator for ISPP and a teacher at San Leandro High School, says his experience with ISPP last year prompted him to enhance his curriculum to include the Big Bang and particle physics. "We couldn't do this work without the Lab," he says. "It's amazing how generous the scientists have been with their time and explanations, and how excited and supportive they are. Getting to work in this environment is inspiring." Teacher research activities include Mike Martin and Wayne McKinney's project to measure pesticide runoff and other pollutants in a Vallejo creek; Eddie Moler's construction of a genetic disease web data base; Werner Meyer-Ilse's materials science research; and Deirdre Olynick's silicon research in the nanofabrication lab. "Projects like our creek water analysis demonstrate to students that science is a lot of problem solving," Martin says. "This will hopefully help inspire them to look at other interesting questions all around them. By showing these students some of what is done at the Lab we are making science come alive -- and making that place up on the hill a lot less of a mystery." The Berkeley Lab fire department was the first to arrive on the scene to put out a wildfire in Strawberry Canyon on the evening of July 9. "Our firefighters were able to get on top of it in a hurry, and catch it on the run," said Lab fire chief Stacy Cox. On June 17, Laboratory Director Charles Shank and City Manager James Keene signed a memorandum saying that the Lab fire department would provide first-response service in specified zones where the Lab could arrive fastest. This fire occurred within one of the agreed upon "first-in" zones, and its rapid containment was a successful example of the collaboration among the various fire departments, Cox says. When a column of smoke was spotted through a window facing the canyon at 8:00 p.m. last Friday, acting captain David Piepho, driver Charles Palmer and firefighter David Cesmat responded immediately. As a result, the fire was rapidly contained. About one quarter of an acre of brush and trees were burned, but no buildings were in immediate danger. The Berkeley Fire Department was notified on dispatch of the Lab crew, and arrived to find the fire extinguished. Do you have an interesting story to tell? Did you or one of your colleagues accomplish something you think others would like to hear about? Are you working on some interesting research? Do you have a picture you would like published? If so, please send your suggestions to [email protected] We cannot publish every item submitted, but we will consider all suggestions. "Don't overestimate conspiracy and don't underestimate incompetence," warned Wolfgang K. H. Panofsky, director emeritus of SLAC during a noon lecture on Tuesday. Addressing a packed Bldg. 50 auditorium, the famous physicist discussed the Chinese espionage scandal and accused the congressional report on Chinese intelligence activities, which was chaired by Rep. Christopher Cox (R-CA), of "casting aspersions it could not support." Panofsky also criticized the media for hyping the report's allegations of security breaches while largely ignoring the far less sensational conclusions of the U.S. intelligence community. Photo by Roy Kaltschmidt. Berkeley Lab's July blood drive continues on Thursday, July 22, from 7 a.m. to 1 p.m. in Bldg. 70A, Room 3367. Donors are urged to make an appointment as soon as possible by calling X4009 in order to help organizers plan the event. The blood drive will benefit the Blood Bank of Alameda-Contra Costa Counties. For more information or to register, contact Helane Carpenter at X4009 or [email protected] lbl.gov. Whenever possible, walk on sidewalks. When sidewalks are not available, walk on the side of the street facing traffic. Do not take shorcuts through unpaved surfaces, as uneven, broken ground increases the possibility of falls and other mishaps. Bike defensively -- that is, expect the unexpected from cars and other vehicles. Do not pass cars when traveling downhill. Use brakes just as cars do. Remember that drivers may not see a bicyclist in time when pulling into traffic from driveways. A little safety awareness can go a long way towards getting all of us home in one piece every day. The Bldg. 903 warehouse has surplus office supplies available to any Lab employees. Included are items such as three-ring binders in a variety of sizes, as well as more costly office supplies. For more information call Charles at X5813. A mountain lion was spotted on the Hill last weekend crossing Centennial Drive from the Lab to Strawberry Canyon, just below the Botanical Garden. Although as a rule mountain lions are wary of people and try to avoid us, safe is safe; so we may want to do our share to stay out of their way and, most importantly, come away unscathed should we encounter our feline neighbors. Some helpful tips on the subject, prepared by the California Department of Fish and Game, can be found on the UC Police Department website at http://www.berkeley.edu/ucpolice, under the heading "crime alerts." Basic safety tips include: do not run from the lion but stand and face the animal; do not turn your back or make any sudden movement; make eye contact; avoid squatting, crouching or bending; do all you can to appear larger; and fight back if attacked. For further information contact Treacy Malloy of UC's Office of Emergency Preparedness at 642-9036. Berkeley Lab will host its annual Ergonomics Fair on Monday and Tuesday, July 26 and 27, in Perseverance Hall (cafeteria addition) from 11:00 a.m. till 2:00 p.m.
On display will be computer workstation furniture and accessories (such as keyboards, pointing devices, keyboard trays, chairs, foot rests, document holders, and glare screens), as well as ergonomically-designed hand tools and laboratory equipment (including pipetting accessories). Vendors will be on hand to answer questions. For more information contact Larry McLouth at X5286. The Employees' Art Council has arranged a docent tour of the Treasury of St. Francis of Assisi exhibit being held at the California Palace of the Legion of Honor in Lincoln Park. The Lab tour will take place on Saturday, Aug. 28, beginning at 9:00 a.m. -- half an hour before the museum opens to the public. The Basilica of San Francesco in Assisi, Italy, is the repository of some of the most important masterpieces of medieval and early Renaissance painting, sculpture, metalwork, textiles, and manuscript illumination. These rare works of art, many of which date from the 13th and 14th centuries, will come to Assisi's sister city San Francisco in this once-in-a-lifetime exhibition that celebrates the treasures of Saint Francis and raises public awareness about the severe 1997 earthquake damage to the famous basilica. Additional information on this exhibition can be found on the web at http://www.thinker.org/legion/exhibitions/assisi/index.html. The full text and photographs of each edition of Currents are published online at http://www.lbl.gov/Publications/Currents/. You may find a link to Currents on the Lab's home page under the heading "Publications." The site allows users to do searches of past articles going back to 1994. Lab Deputy Director Pier Oddone, recognized as "the father of the B Factory," will talk about this five-year, $287 million project during a lecture on "The Asymmetric B Factory: Reflecting the World in the CP Mirror." The accelerator's collisions of electrons and positrons are intended to produce particles of matter and antimatter whose study may offer clues to the standard model theory of how the universe developed. Particle physicist Gerson Goldhaber of the Supernova Cosmology Project will present "direct evidence for the expansion of the universe" in his talk on "Supernovae and the Expanding Universe" -- a discovery Science magazine named the "Breakthrough of the Year" in December. What drives the accelerated expansion may well be a version of Einstein's cosmological constant, "something particle physicists hate, but cosmologists are learning they can't live without," says Goldhaber. Classes are held in Bldg. 51L. For more information on AIM training, class description and registration procedure, look up the class website at http://www.lbl.gov/Workplace/EDT/computers/PC_Classes.html. Note: All in-house courses at this time are taught on PCs with Windows 95reg.. The 7.0 series programs are used by the newest version of Microsoft Office for Windows 95reg.. Series 6.x programs for the Mac are nearly identical to the Windows 95reg. versions. For users of a Mac 6.x series or an older Mac or PC version, the material covered in these courses will be applicable. MOVING SALE, sofa bed, futons, bed, plants, coffee and dining tables, wooden furn, electronics, much more, Sylvain, X5419, 235-5318. Ads are accepted only from LBNL employees, retirees, and onsite DOE personnel. Ads must be submitted in writing ([email protected], fax X6641, or mailed to Bldg. 65B). They will be repeated only as space permits. The deadline for the July 30 issue is 5 p.m. Friday, July 23. The deadline for the July 30 issue is 5 p.m. Friday, July 23.